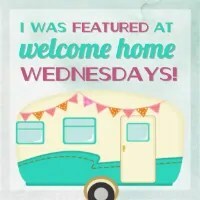 Welcome to Welcome Home Wednesdays #75!!! Well, the kids finally went back to school today. I think we’re up to 10 days they’ve missed because of snow and ice! Anyway, it’s great to get a schedule back and devote some time to blogging! How’s everyone else’s week going? Like any good hosts we’re sitting right by the present table waiting until our guests leave so we can go through the loot… the loot being your Welcome Home Wednesdays #75 links! We can’t wait to check out what you’ve left for us. Trust me there will be a lot of pinning, tweeting and facebook sharing going on in the near future… we can’t wait to show off what you’ve left! Thanks for the wonderful party this week. Thanks for partying with us and thanks for the comments! Have a great week! Thank you so much for hosting every week. I look forward to sharing. Have a wonderful week. Thanks for stopping by with your delicious posts, Marilyn! Have a wonderful week! Erin, I agree it is nice for the kiddos to be in school finally! I am over the snow and ice. Thank you for the party!